A Change.org petition demanding that Jon Stewart moderate a 2016 presidential debate has garnered upwards of 160,000 signatures, including an endorsement from one Democratic presidential candidate. The petition, created about two weeks ago, defines the former Daily Show host as "more than qualified" to moderate one of the three major presidential debates next year, citing his multiple interviews with U.S. lawmakers, government officials and political leaders. "Over the last 16 years, Jon Stewart has played an influential and iconic role in covering U.S. politics and media," the petition reads. "We believe he should continue that tradition as a moderator at one of the 2016 Presidential Debates." Indeed, the liberal television personality has played a "role" in U.S. politics during his time heading the Comedy Central program. In advance of Stewart’s final episode as host, news broke that the comedian made two separate visits to the Obama White House in recent years to consult with the president. The first meeting occurred in 2011 as Obama geared up to run for reelection, and the second took place in 2014 on the morning before the president appeared on TV to warn Russia against taking further military action in Ukraine. During each quietly held meeting, Obama took the opportunity to sell his administration’s ideas. The Change.org petition, created by a New Jersey woman, contends that Stewart is "the most trusted person in (satirical) news." Among its more than 160,000 signatures is that of Democratic presidential candidate and former Maryland Gov. Martin O’Malley, who declared his support for the petition on Twitter Thursday. O’Malley currently has 2 percent support among likely Democratic primary voters. 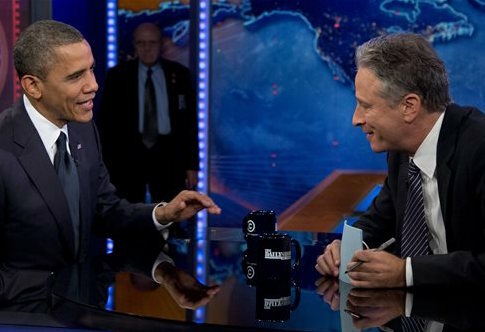 Stewart hosted Obama seven times on the show. Democratic lawmakers were allegedly "worried" by Stewart’s exit. "I’ll tell you, some Democrats are worried," Sen. Claire McCaskill (D., Mo.) said last month. "He’s done a great thing for us reminding young people why the Republican Party is out of step." This entry was posted in Politics and tagged 2016 Election, Barack Obama. Bookmark the permalink.